Been long since I am posting. What have I been up to? Well, the answer is absolutely nothing. Had been entangled in dilemmas. Unorganized to the core. A lot of new experiences are generating a lot of new emotions. Never been so conscious of my existence. Stuck up in duality. Unaware as to when I am faking and when I am not. The line between real and unreal is blurred. 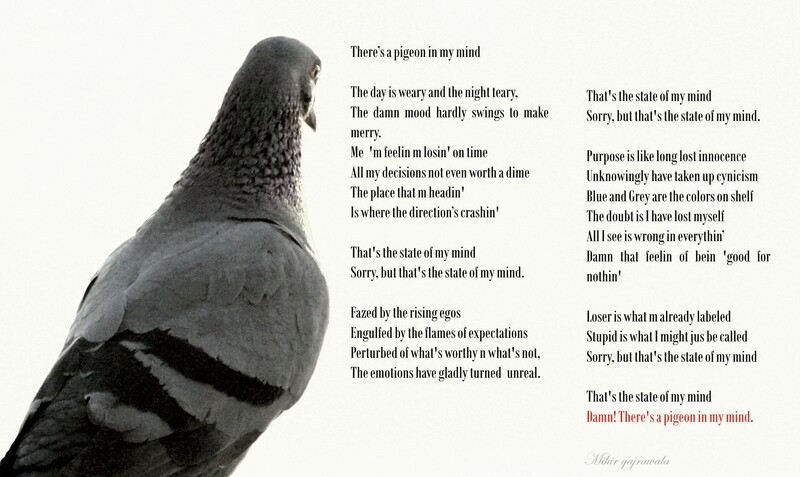 A constant faze clouding my mind..a continuous flutter of thoughts in my mind…as if there’s a PIGEON IN MY MIND.